Grand Bay Wildlife Management Area is located in a 13,000 acre wetland system. Launch a boat or canoe and follow trails through the haunting Blackgum Swamp, or travel a 2,000-foot boardwalk to Kinderlou Tower to view the open prairie and the heron rookery. 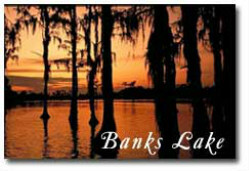 Banks LakeNational Wildlife Refuge in Lanier County neat Lakeland, contains a variety of habitat types, including 1,500 acres if march, 1,550 acres of cypress swamp, and 1,000 acres of open water, with upland pine and hardwood forests scattered throughout. A natural “pocosin,” or sink of ancient geological origin, the refuge was established in 1985 for the protection and conservation of this unique environment, as well as for the migratory birds and resident wildlife. Bank’s Lake open waters are part of a very popular freshwater public fishery that includes largemouth bass, chain pickerel, bream, crappie and others. Facilities include a bait and tackle shop, boat ramp, walking trail, and two fishing docks. The wildlife viewing is spectacular, with fowl in the refuge including widgeon, blue and green winged teal, wood ducks, American goldeneyes, osprey and bald eagles! Reed Bingham State Park has 1,630 acres that surround a 375-acre lake with a swimming beach, where visitors can enjoy boating, water skiing and fishing. The Coastal Plains and Gopher Tortoise Nature Trails feature a cypress swamp, pitcher plant bog and sand hill area for hiking and nature enthusiasts. 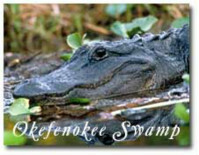 Okefenokee Swamp is the largest swamp in North America and features over 120 miles of water trails. 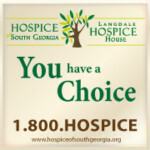 Good Hope Plantation is located in Naylor. The plantation is a retreat for today's businessperson and sportsman. Its 2,000 plus acres offers hunting and related recreational activities for business professionals and their valued clients. 229-482-2686. Additional sites include Alapaha River, Simpson Nature Trail, Lake Irma, Roquemore Memorial park, Cypress Lakes, Twin Lakes, Litter River, Grassy Pond, Paradise Island Hunting & Fishing Club, Quail Creek Shooting Club, Indianila Hunting Preserve, and many more.